Ottawa has a great transit system. The buses, run by OC Transpo will get you to most places in the city rather quickly. The main highway that runs East-West through Ottawa, (Highway 417), has an express route that allows only buses and cars with more than one occupant. This means that even during rush hour, the buses can usually get you where you want to go quickly. 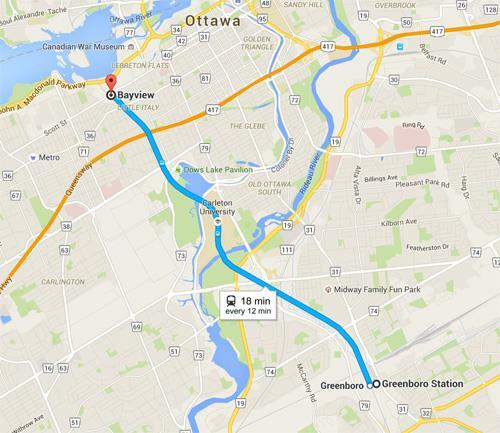 Ottawa also has a light rail system, but it is only available in the South end. If you are traveling East - West (which is the most common route), buses will be your only public transportation option. To ride on Ottawa's OC Transpo buses you can pay with cash, tickets, a day pass, a month pass, or something called PRESTO. The following information applies to Adult and Student prices. For more information, including Senior and Child rates, see the OC Transpo Website. Presto cards are a replacement for tickets and cash. You simply tap your card on the card reader when you get on the bus. While Presto cards don't save you money, they make it more convenient to ride the bus. They are easily topped up online. You can find more information on getting a Presto card here. If you are a full time student at participating schools you can buy a U-Pass from your student association. More information here. At first it can be a little confusing understanding Ottawa's Bus Routes. We've done our best here to outline the most useful information. We have found that there are two good ways to figure out your route. Ottawa has over 7000 parking spots that are available in Park-And-Ride lots. Many of these lots offer free parking, but some of the extra busy ones do charge money. The OC Transpo website has a list of all of the Park and Ride Lots in Ottawa. That page will also tell you whether parking is free or paid. In some cases you can buy a Gold Permit to also be sure that you have a parking spot. However, Gold Permits tend to sell out. All of OC Transpo's buses are low floor accessible which makes it easier for the elderly or physically disabled to board the bus1. Ottawa also runs Para Transpo buses that cater to customers whose disabilities make it difficult for them to take a regular bus. Para Transpo buses can accommodate wheelchairs up to 30 inches wide by 60 inches long and scooters up to 30 inches wide by 50 inches long. How does Para Transpo work? In order to take an Ottawa Para Transpo Bus, you need to fill out an application. Click here to download the application form. You then need to have your doctor review and fill out part of the application. It can take up to two weeks to have your application approved. Trips on Para Transpo need to be booked in advance by calling 613-244-7272. You can also set up regular bookings for trips that you know will happen on a regular basis. It is recommended to call one day in advance, but sometimes same day bookings can be made. Here is more information on Para Transpo Fares. 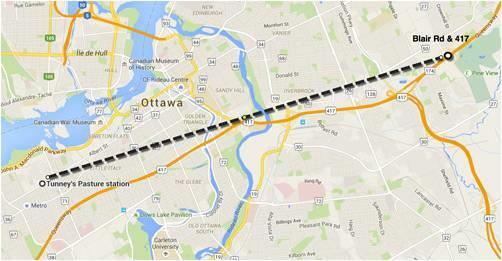 Ottawa currently has some light rail and plans to expand. At this point, the majority of public transport is offered via busses. At the time of writing this article, however, the only option for light rail in Ottawa is the Trillium line. While many people are hoping for an East-West line that would extend as far west as Kanata, there are no immediate plans to build this. There have been some rumblings of eventually extending the line west past Tunney's pasture to as far as Bayshore station. Riders with a Presto card have slightly reduced fares. Visit the OC Transpo website for complete and up to date information on fare prices.